Toddler Approved! : Ramps and Water Painting! Since it is nice and warm now where we live, we love doing anything with water. We started this activity inside, but then moved it outside later. You could do it outside the entire time and even get into swim suits if your child really decides to get into it and get nice and wet. Materials Needed: ramps (we used some slides and race tracks that we have, you could also use blocks, boxes, wrapping paper tubes cut in half, or whatever else you have lying around), two pans (any shape is fine), some building blocks (or boxes) for your ramps to lean on, water, a bunch of objects that are round or have wheels, and colored paper. 1. We started by getting our ramps set up and gathering our round and wheeled objects. 2. We also chose some colored paper and got a cup of water. 3. Next we poured a small amount of water into each pan (about an inch high). 4. Then we started zooming our cars and round objects down the ramps! Once the objects zoomed through the water, we drove them on top of our colored paper to do some water painting. The textured balls left some great speckled patterns on the paper. We also used our race tracks to make the cars zoom into the water... and then across the paper again. Racing cars against one another into the water was a lot of fun too! 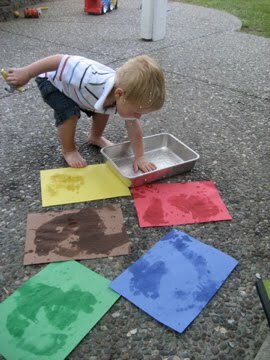 After we raced and painted with our cars for awhile, we moved our water-filled pan outside for some more water painting! 5. Have your child go stand in the water and get their feet nice and wet! 6. Lay out colored paper close by and just watch what they do! You'll both be amazed at the footprint creations that they make. and then he started bouncing his rubber balls in the water and then onto the colored paper... so we had ball splatter painting too! We could've done this forever! With the warm weather, the water pictures slowly start disappearing (kind of like your own homemade Aquadoodle) and you can re-use the paper again and again. If you have a baby pool, backyard slide, and large colored paper, you could even try body painting! 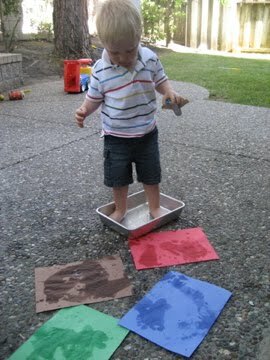 Have your child slide down the slide into the water and then sit, jump, lie, or roll on top of the colored paper. Their bodies will make some pretty cool pictures. Language building can be embedded into any activity. I find that it is easier to teach new vocabulary (or expand language) during a fun activity because the child is extra motivated and excited. During this activity we spent a lot of time commenting about what we were doing and what we saw. "I see thin lines!" "I rolled the ball down the ramp!" "I jumped on the blue paper" "I am bouncing the ball on the paper." You can start out by modeling some simple statements and then prompt your child to make their own. If they say a partial phrase, turn it into a complete sentence for them, and then try and get them to repeat the sentence. Be warned, pretty soon your child might be ready to be a professional commentator or announcer. My son can barely make it through an activity any more without narrating what he is up to! We try to focus on using the pronouns "I, me, you" and modeling with those otherwise I've discovered that my toddler makes observations in the third person- "Andrew is driving the car," "Andrew is rolling the ball." Most of all, have lots of fun and talk, talk, talk about anything and everything while you are playing together! I love to water paint with my daughter outside. We have a flagstone walkway with gray, brown, and red stones set in white surround. I love to hand her a bucket of water and a paintbrush. At 3 she is very intent on coloring the whole rock before moving on to the next. We are even able to talk about the sun and evaporation when we can see the sun start to dry the rocks. We also talk about VERY wet (dump the bucket) and just a little wet (squeeze out the sponge brush then try to paint.) One spinoff of this activity was that my daugher spontaniously started to clean up the chalk drawings on the driveway too!